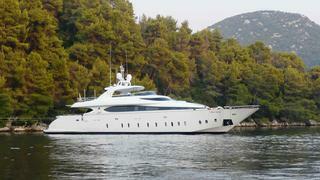 The 31.8 metre motor yacht Tuscan Sun, listed for sale by Yachtzoo, has been sold in an in house direct deal. Tuscan Sun was built in GRP by Italian yard FIPA to a design by Roberto Del Re as one of its Maiora range of sporty yachts and delivered in 2008 as a 32 DP model. A one owner yacht until now, she has a modern interior in shades of white boasting all modern conveniences and separate areas offering entertainment space or quiet privacy. The main deck saloon has a large round table to port acting as a dining and games table while forward is the lounge area with two settees and occasional armchairs. The entertainment centre on the forward bulkhead includes a 60 inch plasma television screen and a Bose Lifestyle stereo sound system. Accommodation for up to 12 guests is in five large well appointed cabins consisting of a full beam master suite aft, a VIP suite forward on the main deck and two twin cabins, each with a Pullman berth, amidships. There is also one additional VIP suite with a double bed and all cabins have television screens and en suite bathroom facilities. Twin 2,750hp MTU diesel engines give her a cruising speed of 23 knots and she is fitted with zero speed stabilisers. Lying in San Remo, Italy, Tuscan Sun was asking €2.9 million.